I have an appointment with an orthopaedic specialist next week to discuss further options which looks to include additional surgery. I slept well last night. I took two painkillers prior to bed. I woke up at 3:11AM, I had the crash dream and as usual I awoke before I hit the ground. It is odd, when I gave my statement yesterday I realised that I do not remember actually hitting the ground, I only remember hitting the car, flying through the air and then actually being on the ground and trying to get up and get out of the way. I expect that sometimes it is better to not remember those things. Today the pain is about 2/10 mostly, but if I move I can spike it to 8/10 or more. It feels like a knife is being twisted in the soft tissue under my shoulder blade. I went to the gym this evening, I ‘cycled’ for about 30 minutes, then called it a day. I have no strength in my left arm at all. The stabbing pain that I get when I move the wrong way is terrible, it is a very, very sharp pain, which drops off over about 2-3 minutes, but it is excruciating when it happens. One really, really bad night. I am not sure why, but I am sure I am getting worse again. At several points in the night I had to lie flat on my back with my left arm folded over my chest, this is the only comfortable position that I could find. I finished off the Ibuprofen. Not sure how many I took in the night. There was however some slightly good news this morning. The stitch that has been sticking out of the wound for the last six weeks and causing me all sorts of irritation was very loose this morning, so I pulled it gently and it came out. I doused the area in antiseptic cream and it already looks a lot better. This is one small thing to check off the list I suppose. I cannot wait to go to the docs on Tuesday – I need a resolution. I cannot help but associate the stabbing pain in my shoulder with the apparently over-long screws used in each end of the plate. This was a significantly hard night……. I nearly blacked out this morning I reached for a notepad and twisted my arm and the pain was off the scale – 11/10. While the pain subsided relatively fast, I certainly do not want to feel that again. The stabbing pains in my shoulder and my upper left arm are seriously painful. It has been all night. It seems that if I move to far, then it feels like my shoulder is caught on the screw and the pain travels all the way to my elbow. Moving back it takes about ten minutes before the pain subsides. Spent much of the day protecting my arm. Still have almost no ability to carry anything, pick things up of any weight or even move in anything other than a very conservative manner. A bad night, aches and pains are literally ‘bone deep’ in my shoulder and upper arm. Resorted to Ibuprofen+ early this morning and continued to take them through the day. Scar has become very, very sensitive recently, presumably as the nerves re-attach. It itches and it feels very odd a lot of the time. Hurt myself really quite badly trying to wipe a window this afternoon. Now propped up and feeling sorry for myself. Not a terrible night, but not a good night either. The stabbing pains and pins and needles woke me up several times in the night. This morning putting a shirt on was painful. 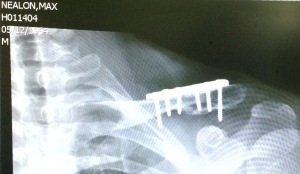 Went to see Mr. Packer this morning, he feels that the screws are ‘way too long’ and are causing me issues. He wants to replace them as soon as possible. He also feels that I am suffering with ‘frozen shoulder’ mostly due to the pain I am in. 12:50 Mr Packer’s secretary called, he wants to do the procedure on Thursday afternoon. Not sure exactly what time, I am waiting for the call from the booking staff. Bad evening, took Ibuprofen and codeine early on, then codeine before bed. Woke three times in the night, stabbing pains in my upper arm, scar itching like crazy. Waiting to hear from the hospital regarding Thursday. I am in for surgery at 12:30 tomorrow. Not sure how I feel about this, on one hand it should help, on the other it will set back my recovery a little as they need to open up the wound to replace the screws. 9AM – tense, nervous, pensive. All of these. Shoulder is ‘on fire’ again, stabbing pains in my upper arm are not going away. 12:00 Noon – Taxi to the hospital, arrived very fast. I am really, really pensive. This time I am getting my surgery at the local private hospital courtesy of BUPA. The hospital is very clean and very smart. My private room has an ensuite bathroom and is very comfortable. 12:30 all checked in – now the waiting begins. Met with surgeon, who wrote all over my arm ! and promised to give me the screws he is going to take out. 14:30 – and down to surgery I go. Anaesthetist is hilarious and very comforting. 16:15 – its all over, I am awake an in the recovery room – pain is ‘off the scale’ for a while, given lots of drugs, but pain remains. Not sure that I can cope. 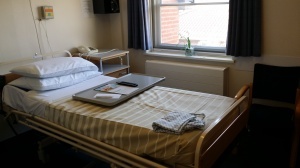 16:45 – back in my room, more pain killers and tea and sandwiches – I was so hungry, I drank two pots of tea and many visits to the bathroom later and more tea and a mars bar, I am getting ready to leave. 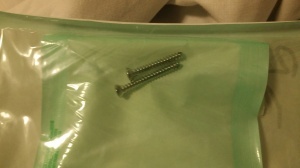 19:15, screws arrive in a little envelope, they are smaller than I thought, but rather long. 20:00 checked out of the hospital an on my way home. Craving curry sauce and chips ! Hospital have given me a two-week sick note, also have a physical therapy appointment on monday and a surgery follow-up October 20th. Massive dressing indicates that the wound may have been re-opened. This is a disappointment to me, it took almost six weeks to heal last time, so I am now looking at another six weeks to recover from this one – which puts me into the end of November ! 22:40 – in bed, very uncomfortable, have taken Ibuprofen and paracetamol This is going to be a really long night. Propped up, but uncomfortable. Pain is around a 6-7/10 – not unbearable, but seriously painful. It is concentrated on my shoulder joint mostly. 01:15 – agony. Utter agony.I think that all of the painkillers wore off at the same time. Took Ibuprofen and waited for it to kick in. struggled to get comfortable, the slightest movement took me from manageable pain to agony. I get the feeling that I am feeling the full effects from the procedure. 04:12 Awake again. Pain bad – 8/10. Took paracetamol, totally failed to go back to sleep. 06:30 feel like hell. Pain in shoulder is bad – 7-8/10. 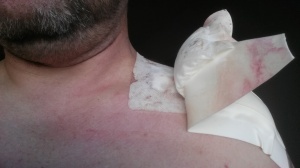 during the night the dressing partly fell off, think it is best to pull it off else it will irritate the hell out of my neck. Rough day – shoulder is agony no matter what I do. Slept on the sofa a little while watching TV. 3:10 – panic – a trickle of blood has emerged tom the dressing and run all the way down my chest, Called the hospital, they told me to come in and they will fix it. 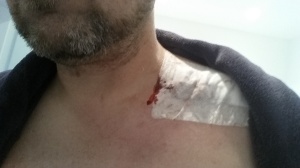 Taxi to the hospital – Not entirely sure what happened, but a large amount of blood was in the dressing, the nurse cleaned it all up and re-dressed it, told me off for moving too much and sent me home with pain killers and a new dressing. Photographed wound – it is not quite as long as the original, but I am in for a long wound recovery again it seems. Stitches are not as neat this time. Taxi home, feel like hell. Uncomfortable evening, went to bed at 8:30. The new pads on the wound are way better than anything that I have previous. They are protecting my wound really well. Great improvement in my mobility, no stabbing pains, but the big ache in my shoulder remains. Feel that I will be much better off this time around. Not exactly looking forwards to my appointment on Monday for Physical Therapy though. A much better night – Woke at 2AM and took 2 paracetamol, then awoke ‘for good’ at 6:15 this morning. Spent much of the morning moving as little as possible, but already realise that I fee a heck of a lot better today than yesterday. Pain barely crossed the 3/10 threshold all day, with just a couple of times after moving awkwardly pushing it past there. I watched the F1 race from Russia and that saw so boring it almost put me into a coma, I am sure that helped. Started a build a bicycle repair list on Amazon. New Tape, New seat, new tyre (noticed the front is split) and a few other bits, already over £150. By late evening the pain is coming back somewhat, a couple of Ibuprofen+’s and sleep time. I slept pretty well, waking several times in the night I only took paracetamol twice (2AM and 5:30 AM). At 6:30 I got terrible cramp in my upper arm – I’m not sure why. This has happened a few times in recent weeks though. I will ask the therapist later. Not looking forwards the PT. Well I am, because I know that long-term this is necessary. Physiotherapy appointment was not too bad – I have much more movement than I did prior to surgery. Upper arm is now on fire. I now have a set of exercises to do daily. Cramp hit me last night – super painful in my upper left arm. Took Ibuprofen in the aftermath of the cramps and managed to get some sleep. Once more, super tired today. Feeling worn out, managed to get through the exercises though. Much better night, no cramps, just plenty of pain – took Ibuprofen at 4AM. Exercises are working – I have better movement. 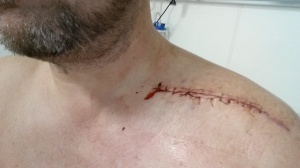 Took dressing off and had a look – seems to be healing well, looking forwards to getting stitches out on Monday. Bad night. Very bad night. Lay awake much of it. Took ibuprofen at 2AM, then again at 5:30. Exercises still helping mobility. Strength is another thing entirely. Not happy that all of the effort I put into getting fit has gone to waste…. Sorry to hear you’ve been in such pain, Max. Definitely have the docs look very closely. They DO make mistakes now and again, and you may have diagnosed correctly the too-long pins, or it could be something else. It sure doesn’t sound like what one would expect to be happening at this stage. I’ll send an email separately… just was thinking of you today so I’m glad I came home to see your post. Just wish it had been less difficult for you these last 3 months.